Motorway exit PESCARA NORD – CITTA’ S. ANGELO. Turn right and continue for Elice, in location Quattro Strade turn left and continue for Penne. Immediately after the bridge turn right and cross Baricelle. Continue straight until the turning for Penne, turn left and drive until you reach Penne, follow the signs to Chieti. 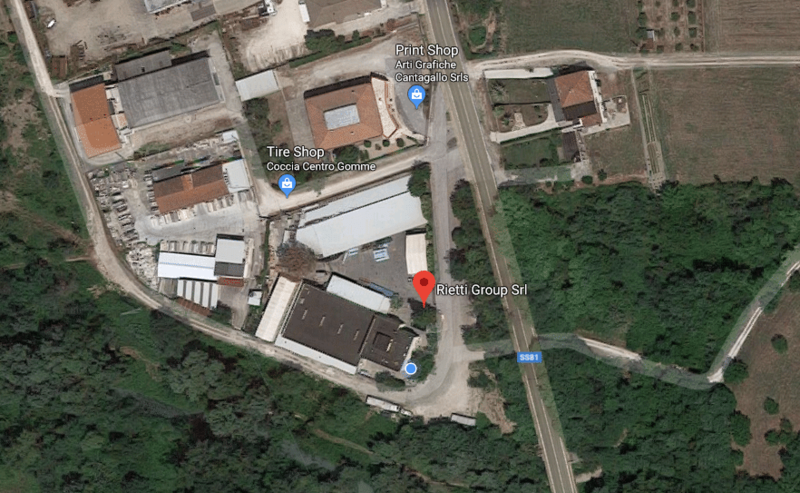 After around 2 km from the exit of the city, you can find RIETTI GROUP SRL on the right side of the road. Usctorway exit PESCARA – CHIETI. Follow the highway SS81 and continue for Villareia and then for Cepagatti. Once in you arrive in the square of Cepagatti, turn left and continue for Pianella. After around 6 km at the roundabout, turn left and continue for Penne. Once you arrive in S. Pellegrino, keep on straight. After around 1 km you can find RIETTI GROUP SRL on the left side of the road.